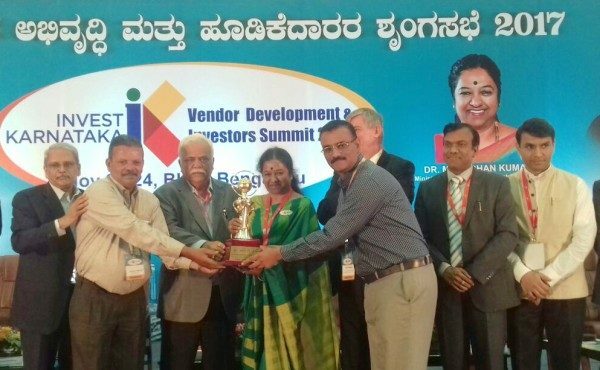 REC Engineering (formerly Reliance Engineering Corporation) of Udyambag, Belagavi, has bagged “Export Excellence Award” (Product category – Engineering Sector SME 2015-16) from Karnataka State Government. REC Engineering, a 100% Export Oriented Unit, manufacturing ready to use Engineering Products, for valves and pumps industry. REC’s senior executive Manish Bongale and GovindAshtekar received the award from Minister for Medium and Large Industries, Shri.R.V.Deshpande. REC, was established 30 years ago, as 100% EOU unit, and has received so far, 45+ “Export Excellence” awards from various state and regional levels. During 2017 alone, REC has received three export excellence awards from state and at the vendors meets. RECis a strategic supplier, since inception, to overseas customers, in highly developed countries of USA, Germany, England, Denmark and China. REC has four manufacturing plants in Belagavi area, providing employment to 350 persons directly and 200 families indirectly, through a dedicated supplier network. REC uses 100% local raw material and machining resources, for manufacturing and exporting their entire output. Thus, REC has achieved a 100% value addition in exported products, as there is no import content, thus earning a very positive foreign exchange for the country. Previous articleWinter session ends but did it achieve what it was called for?